As a songwriter, O’Brien has a gift for finding the profound hiding within the mundane, and bringing it out in a way that is both casually conversational and deeply felt. The earthy wisdom of Chicken & Egg’s songs are delivered in appropriately spontaneous fashion, largely recorded live in the studio with a core group of collaborators. 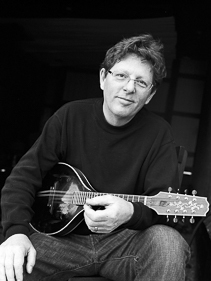 In following his previous album, 2008’s entirely solo Chameleon, O’Brien says, “It was time to make a more acoustic record – more along the lines of a bluegrass thing, with an ensemble and not a lot of production: something pretty down-home, featuring a more consistent band.” To do so, he spent four days in the studio with master musicians Stuart Duncan (fiddle, mandolin, cello, banjo), Bryan Sutton (acoustic and electric guitar), and bassists Dennis Crouch and Mike Bub. O’Brien contributed mandolin, guitar, bouzouki, fiddle, and banjo, while drummer John Gardner enlivens many of the tracks. The cast of harmony vocalists includes Abigail Washburn (Sparrow Quartet, Uncle Earl), Chris Stapleton (the SteelDrivers), and Sarah Jarosz. In 1996, O’Brien moved to Nashville. “Can’t Stop the Flow,” featured on the second half of Chicken & Egg, dates from that era, and seamlessly fits the narrative of the album. “Here I am, I’m supporting the family,” O’Brien says, recalling when the song was written. “I’d moved to Nashville to have a chance to send the kids to college. My career was really starting to get rolling, and I was just trying to juggle it all. From that point, I’d been on my own for five years since Hot Rize and things were starting to click pretty good…but not without challenges.